Can it be the heat of Roman summer that makes you feel so tired? The countless hours spent walking through the streets of Rome that make your body ache? When you are unwell in a foreign country, it is way too easy to blame changes in weather or eating habits. If it doesn’t get better, don’t wait any longer! Visit a medical centre in Rome for proper diagnosis. A simple explanation for tiredness, sore throat and flu-like symptoms could be glandular fever, also known as mononucleosis, or mono, a disease that doctors can diagnose easily with the appropriate tools. Many call it the kissing disease, but don’t let the name deceive you! Mono is not only spread through kisses. Sharing forks or spoons, drinking from the same bottle or glass can also help the infection spread. Nonetheless it’s not a particularly contagious disease. Mononucleosis is caused by the Epstein Barr Virus, a virus which belongs to the herpes family. The disease, is transmitted through passage of saliva. Rumor has it, mono is especially common among teenagers and young adults, though everyone can be infected. The good news is that once you have had the infection, your body develops antibodies that make it unlikely for you to fall ill again, although once you got this virus, it becomes a lifelong infection with periodic reactivation with oral shedding of the virus. The unexpected fact is that not all that have mono experience symptoms. In fact, there are many asymptomatic patients, who only find out they have had mono later in their life. Patients with a feeble immunitary system are more keen to experience symptoms. Sounds familiar? You may have noticed that the debilitating symptoms caused by mononucleosis are not specific to this infection. Sore throat and high fever for instance may make you think of a tonsillitis, which can be easily cured with an antibiotic therapy. Since mono is caused by a virus, however, antibiotics are not effective…or even harmful! A rash almost always occurs in patient with mononucleosis following the administration of antibiotics, in particular amoxicillin and ampicillin (but it can happen also with others). If you have been experiencing any of the above mentioned symptoms for more than a week, call a doctor in Rome. After a thorough analysis of your medical history, risk of exposure and symptoms, an experienced physician will decide whether it is necessary to run specific diagnostic tests for mono. How can you know if you have mono? A simple blood count will detect the count of lymphocytes in a patient’s blood. An altered value is a sign of an ongoing infection, though not necessarily of mono. In fact, a high number of lymphocytes is characteristic also of other diseases such as rubella and viral hepatitis. 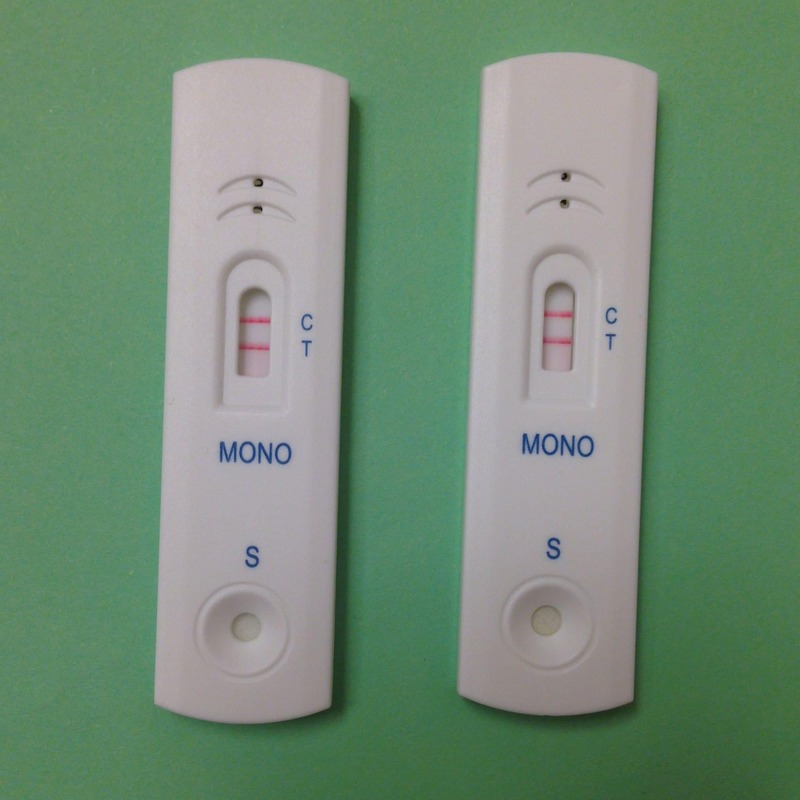 A rapid mono test can be used to diagnose a recent infection right in the doctor’s office. The test can be performed on a small drop of blood and results are ready in less than an hour. Beware! A positive result (as the one shown in the picture) confirms with high level of confidence a mononucleosis infection, while a negative result is not a guarantee. Many factors can affect the reliability of the result.To name a few, testing too early (less than two weeks after exposure) or testing too young (less than 2 years old) can lead to false – negatives. Blood tests for detecting infectious mononucleosis. Yes, we know! Interpreting these results can be rather hard. For instance, testing positive for both EBV EA Abs and EBV VCA IgM can be a sign of an acute (a recent) EBV infection. On the other hand, testing positive for EBV VCA IgG and negative for EBV VCA IgM may be a sign of a previous infection. A bit confusing, isn’t it? Asking a doctor for help is always the best option. If you test positive for mono, don’t panic! Mononucleosis is not usually a dangerous disease and complications are rare (spleen rupture, inflamed liver, anaemia etc.). Mononucleosis, unfortunately, is not treatable and antibiotics are not effective (see above). Symptoms, in particular fatigue, if present, can last for long periods of time. Ask your doctor for medicines to relieve the symptoms and make your illness more bearable. Some rest and relax, a healthy diet and lots of water are often the best cure for mono. Now is the time to take a few days off from your busy school or work schedule, or give up a trip to the colosseum! If you are feeling tired and weak in Rome, and your flu-like symptoms are not improving with antibiotics, call us for assistance. Even if you are only in Italy for a short period of time, a visit to a clinic in Rome might be worth your time!